A few days ago, Da Dominguez of The Diary Queen wrote a blog post that really caught my attention. I read it as soon as I could because I was curious on what she had to say. Basically, her blog post was about some things us bloggers are probably tired of hearing. And I couldn’t agree more with everything that she said. While I may not have a lot of readers as I would prefer, I sometimes get mocked for blogging, and I don’t get why? It’s just my hobby turned into a passion project. It’s like mocking someone who is passionate about video games and constantly telling them, “Naks, gamer!” I mean, is that really necessary? While I know Da’s goal is to shed some light on annoying people, there are perks of being a passionate blogger. #1 is being recognized for your efforts. 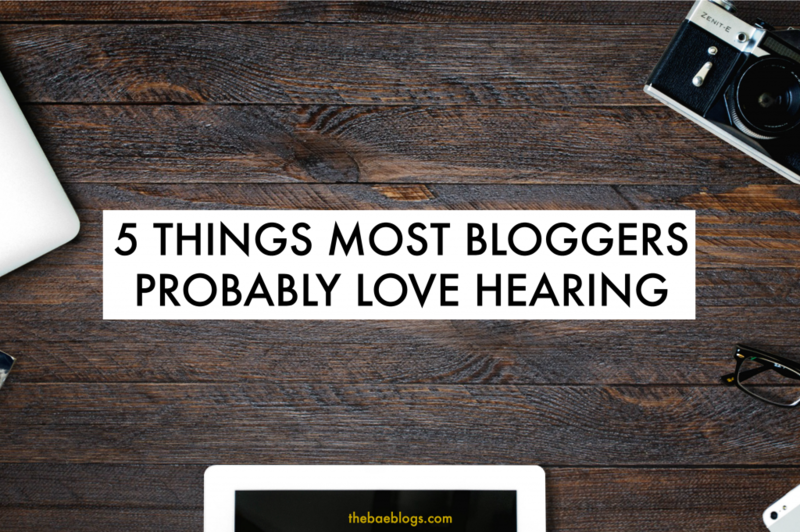 To counter Da’s blog post, here are 5 things most bloggers probably love hearing. If you haven’t read it yet, you can check out Da’s blog post here: 5 Things Most Bloggers Are Probably Tired Of Hearing. I put this first because I know us bloggers get this a lot. I personally find it humbling to gain readers that truly value the work I put out. For me, blogging is just an extension of myself. It’s a form of self-expression, more often than not. So it’s really amazing for us to meet people who care about our opinions, thoughts, and random musings. To spend your time in reading our pieces is enough for us, really. Words have depth, and for us to inspire people with our mere words is truly surreal. Along the way, we meet people who believe in our work and find us credible sources/writers/bloggers. We become friends with people who were once strangers to us and vice versa. Being relatable is one thing, being inspiring is another. If not for my readers constantly feeding me good juju, this blog would have been dead a long time ago. I usually have a “go hard or go home” attitude. It’s either I give my all or none at all. In this case, I pour my all for the sake of my readers because they make me feel this is one challenge that’s worth the fight. Starting a blog is hard, maintaining it is even harder. So to know that I am able to touch lives is enough to keep me writing. ❤️ When asked the question, she said, “[That] I’ve ‘saved and changed lives’. Even though I’m not a [professional] blogger, I’m just happy to reach and inspire people. It made me realize how much words can truly change the course of our lifetime, whether positive or negative,” Iris of Earth Love Skin. Who could have thought that a simple documentary blog post for us could already mean a lot for our readers? More often than not, we blog for the sake of preserving our experiences into words and pictures. Little do we know that someone else is already using our words as a guide for their own would-be experience. While I try to write relatable content for others, of course, I also want it to be relatable to me. I just try to make my blog posts engaging and informative so these would also benefit other people. Sometimes, I just rant and some random reader would come up to me and thank me for writing that blog post. Sometimes, it really starts from nothing. You put out your thoughts and someone else relates to it, and it eventually starts readership. In a more humbling and deeper form, friendship. It also goes to show that someone somewhere out there appreciates our efforts. It’s not that easy to write a travel itinerary, you know. Or a product review where you study the product online, spend for the product itself, take several days to test, and finally write your observations. For Jerny of The Jerny, she shared how a reader successfully avoided being scammed thanks to her travel blog post. It means a lot to us when you notice our work and actually find them helpful. Being recognized for our blog somehow gives us that sense of liberation and responsibility. It’s liberating because we get to write what we want while being relevant, while the sense of responsibility comes from the need to write credible content. Like what a good friend of mine said, “They find my work helpful and they think I’m inspiring.” That comment came from Jhanzey of The Wild Flower. If you don’t read her blog.. why? LOL. This girl’s got the passion for traveling and writing. If you love both, then I’m sure you’ll love her, too! It’s the same with my vlogs. I watch them over and over again until they bore me to death. So I get a little surprised sometimes when people tell me I did a great job with the vlog or they picked up a lesson or two from my ‘Manila tour vlog’. I tend to shrug off my talents and skills because.. I don’t know, that’s just me. So to receive a comment like this from my readers is a huge deal for me. It makes me feel I’m finally doing something right and contributing something good to the blogging community. This positive feedback matters a lot almost always when we feel we’re lacking in the talents department. It’s easy to look at the numbers and see ourselves less worthy because we don’t have enough readers or we wish we had this particular blogger’s status instead. So we appreciate readers who tell us that they value our work and find us talented. I personally often get this with my fitness-related blog posts. Some readers tell me that they started working out (again) because my fitness updates inspired them to do so. I think it’s really humbling, and it also keeps me going knowing that I am able to inspire others. To be honest, most of my fitness-related posts are for me. I keep them to motivate me when I’m having yet another setback. It’s a constant reminder for me to pick up where I started and remind myself why I started in the first place. I recently stopped going to the gym (for the nth time) last month because my membership came to an end and I was somehow dreading my regular visits to the gym. I don’t really have friends there and I don’t have a lot of fitness mentors, so I stopped. But it’s a good thing that I keep all my posts, regardless of how hurtful they can be (to me). They’re simply there to remind me. In line with that, I’ve inspired some people to start on their own fitness journeys. And I’m glad that they did. Maybe someday, I’ll also look into my old fitness blogs and tell myself, “I did this again because of you, self.” In the case of Girlie of Veiled Musings, one positive comment she received on her blog was, “We did this trip based on your post.” Isn’t it wonderful? To hear that someone actually DID something because of YOU? On another note, a reader was even inspired to create her own blog when she stumbled upon Chel’s website. It’s amazing what passion can do, right? As for Irish, 1/2 of Errish Meets World, the most memorable comment she got for their blog was: “Thank you for your detailed travel guide. We really enjoyed our trip because of this.” See how sharing can do wonders? This could be the best positive feedback out of the bunch. It simply says, “I see your uniqueness and I love it!”. Personality is important when it comes to blogging. We all have our different styles, no matter how similar our niches are, and along the way, we attract readers that relate to us because we have the same style. Authenticity is always the key. It’s what sets you apart from other bloggers. So having your own style is a huge thing. It makes you stand out while still being relevant to your readers. Stephy of The Forever Will Be gets that comment a lot. “I love your style!” With a quirky personality and a love for words, it’s not hard to see why readers adore this gal. Similarly, readers love Sunshine of Voluptuous Sunshine‘s unique style. She’s an actor/aspiring model/blogger/friend to everyone in one plump and fabulous package. I’m personally known for being detailed – and I mean excessively detailed – and wordy with my blog posts. I’m not ashamed to admit that because some readers actually like that about me. Besides, my number one audience is myself. For what I lack in social speaking, I make up for in blogging. What I can’t say in front of people, I write. You would never hear me talking this much in person so savor my words while you can. HAHA. Being wordy is my style because I love telling my stories in a superfluous manner. Even the word superfluous is superfluous. This is my way of being extra, if I may. I’d rather a lengthy content than something I can’t squeeze out anything from. My blogger friends can attest to this. Ask me something short and I’ll most likely get back to you with five lengthy sentences. HAHA. I don’t know. I just like explaining stuff. Don’t me. Anyway, our blogs provide our identity for us. Again, it’s an extension of ourselves. And who wouldn’t be glad if someone liked them for being themselves? I don’t understand how this ended up with 1,900+ words, but somehow it did. But you know the drill! Let me know if you have received other positive comments from your readers. I’d love to read them.! In line with a blog post I’m currently working on, I want to know: What is your take on body acceptance/body positivity? You can provide as much answers and insights as you want. This can cover questions such as, “Are you body positive towards other people?”, “Do you love your body, whether fat, thin or between?”, “What do you think of body-shamers?”, and the like. Absolutely love this post, Bae! And thank you for linking my post. Haha. I agree, there are a lot of other good thing to be thankful for in this industry! It’s so heartwarming when someone (esp if it’s coming from a stranger), acknowledges my work, too. ❤️ Kinda gives purpose and direction to what I do. As for body shaming, I recently wrote something similar about it, too. Not sure if you’ve come across it already, but here it is: Skinny Is Not A Compliment. I guess that encapsulates my thoughts on this. “Being relatable is one thing, being inspiring is another.” This! Most of us can relate with almost everything talaga. Pero being able to inspire others, that’s different. Kaya compliment tlaga when people say, “you inspire me” or “your posts inspire me”. With all the negatives in this world, it’s hard to spread positive vibes. Or mostly they’ll reply with hugot lines lang. When I replied to your tweet about body acceptance/body positivity, I wanted to delete my tweet when I said I’d be happy to have a normal weight. I realized late na the word “normal” is subjective. I don’t really care how my body looks as long as I have a healthy weight. Struggle talaga sakin mag gain weight because I have too much acid in my stomach. (and hindi parin ako nag tatake ng medication). So, the doctor said natutunaw na agad ng acid ung food na kinain ko before it is absorbed by my body. Though overall, okay naman ako sa body ko, I just needed to gain weight or be in a healthy weight. Thanks for your honesty, Karen! I really appreciate it! <3 So I assume you don't drink coffee because you're acidic? Bawal din ang maasim? I noticed one thing about your answers - you don't really care about the physical appearance; you're most invested on the internal well-being. I drink coffee, pero not always. I always make sure to drink LOTS of water once na nag coffee ako. And yep, bawal din maasim. That’s why bawal din ako sa dairy, chocolate, etc. Boo! Boring ng food life ko. Hahaha. I used to care nung SUPER insecure ako. Pero don’t care na ako now. Hahaha. I have lots of problem especially sa stomach ko. 🙁 from gastritis, nagkaron naman ako ng gastroenteritis. So, aside from the list of food that I have to avoid, I need to be careful din kasi I might get an infection in my stomach na naman. Hahaha! Sobrang gets ko yung maraming problema sa stomach. I have amoebiasis din kasi so supposed to be I shouldnt be having street food. Or uminom ng tubig basta basta. Tapos recently parang nagrereact na din katawan ko sa dairy ?? I love this blog post! It made me realized why I keep on blogging despite the hardship and time I put into it. Aside from personal reasons, these are the things that keep me going. I read your tweet when you were collecting answers about the positive feedback we, bloggers received so far. But I did not reply cos I thought that the compliments I received were too common compared to others. Then I realized, those little compliments made a huge impact to me and I should have replied! haha!